I have a pretty baller husband. Date night was scheduled for last Tuesday. Just dinner, nothing fancy. Until he calls me up and asks if, by any chance, would I like to go to Obama headquarters as our date instead of the neighborhood bar across the street? Hmm, let me think about that one, oh wait, YES please! And so it was. How, you ask? My husband is in the business of event marketing. 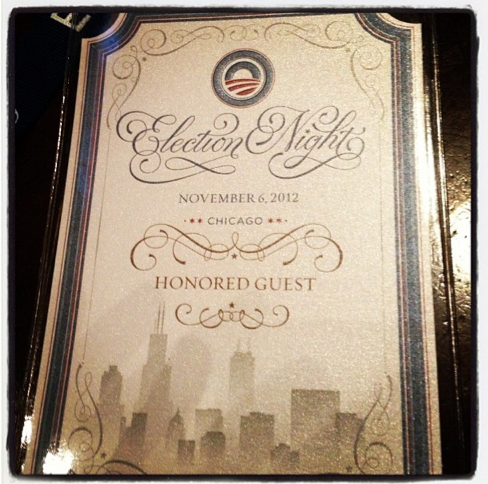 One of his vendors, who sets up many of his events, was also in charge of some of President Obama's events, such as the DNC and election night. As such, we were granted "honored guest" and "production passes" for the night, which granted us access to pretty much anything. 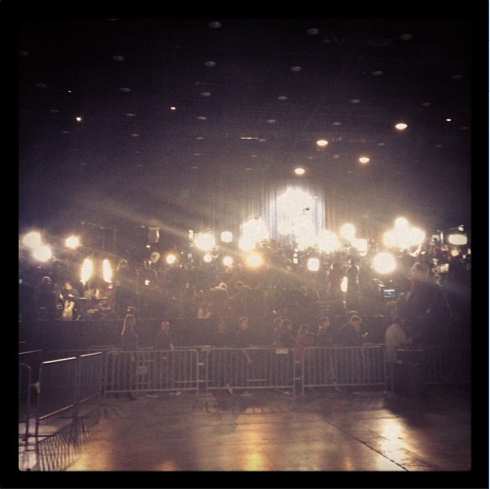 Upon arriving at McCormick Place, we were ushered into the depths of the headquarters. Security was surprisingly not horrible, but it was semi-cool seeing all the secret service peeps. OK, it was super cool. We went down to "the floor" as they called it, where we got to see where all of the big networks were camped out getting ready to go live, the press back of house (in the basement), where everyone was tracking all of the incoming votes and doing live tweets/blogging; AND the press area on the the floor. In other words, when you saw the folks reporting from headquarters with the stage in the background. We also got a view of the floor before everyone crowded in front of the stage. Press on the floor (left); note all of the lights. Press back of house on (right). 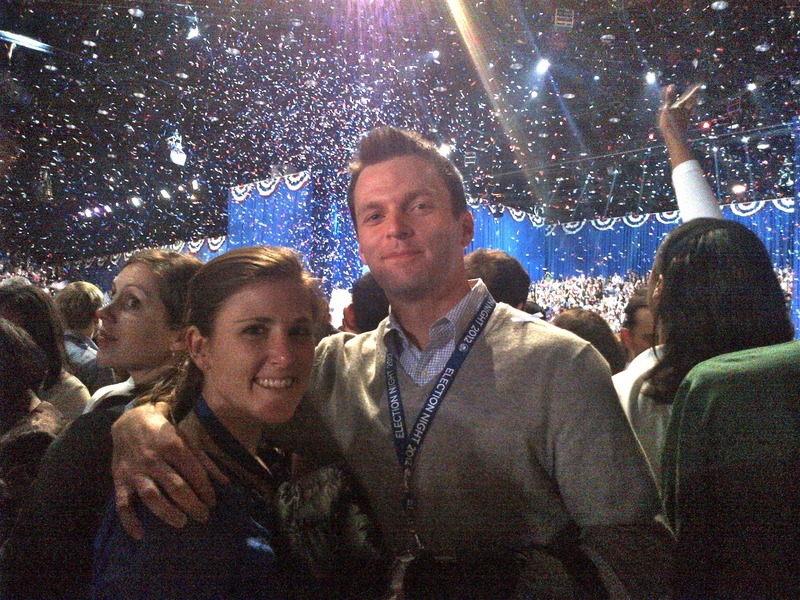 After our tour, we got to camp out in the V.I.P room where we had some drinks while we watched the votes come in. 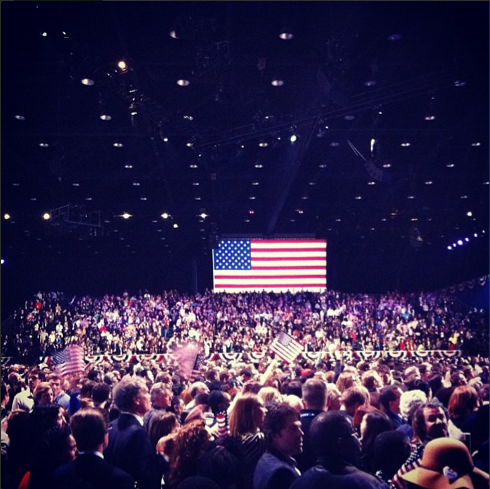 Every time Obama got a state, the roars you could hear were incredible! It was such a rush just being in the same room as people who all wanted the same thing. 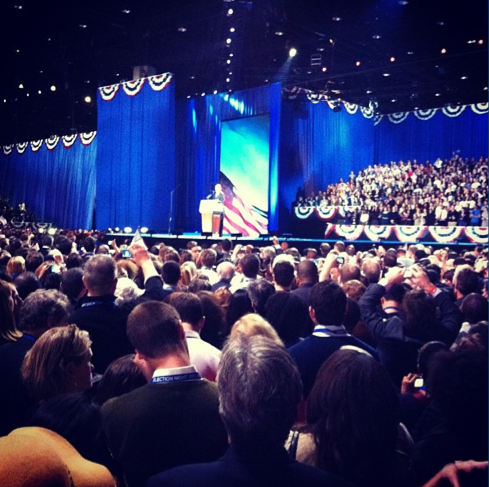 As soon as Obama got Ohio, we knew it was time to go upstairs and join the crowd. It was a little premature, since it took forever for Mitt Romney to concede the election. Again though, the excitement in the crowd was contagious. There was music, there was dancing, there was cheering. 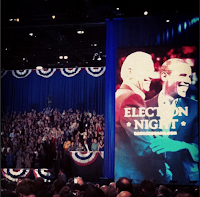 Everyone was respectful as Romney made his concession speech and everyone applauded him when he was done. There was no booing or hateful comments; just respect, which I thought was admirable. 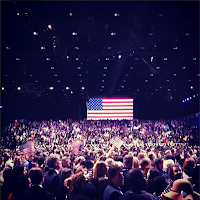 And then...President Obama took the stage. I can't accurately describe how purely awesome it was to be there to see him speak. Obviously, I am an Obama supporter. But even if I hadn't voted the way I did, I don't think I could have stood there and listened to him speak without being impressed. His speech was so inspiring, so genuine, so completely spot on. I was smiling from ear to ear as I listened to him. I'm not even close to accurately conveying how incredible it was to be there for this historic event. How inspired, happy and excited everyone in the room was. 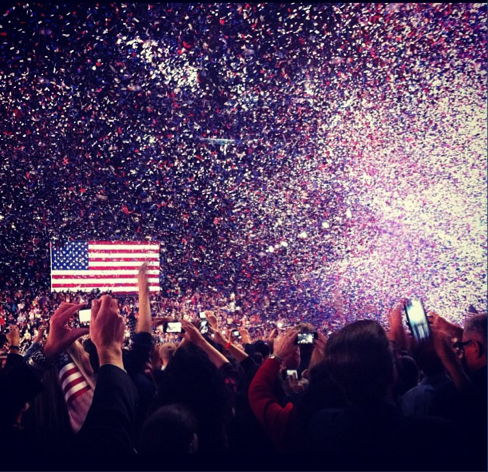 And when the confetti came down—I heard ringing in my ears for hours. Afterwards, we went back downstairs where we had some celebratory drinks. Campaign workers kept coming down to get bottles of wine, running on adrenaline of 4 years of hard work. Another awesome moment. We didn't get home until 3:00am, only to get up again four hours later. It was worth it. And there you have it. The best date I've ever been on, with my husband and the President of the United States. Bryan and I after the President left the stage. Wow what a thrill! I can't even imagine!!! Rachael, I am so envious of yours and Bryan's experience. I know how pumped I was after 2008 when there was a celebration at the Lincoln Memorial. 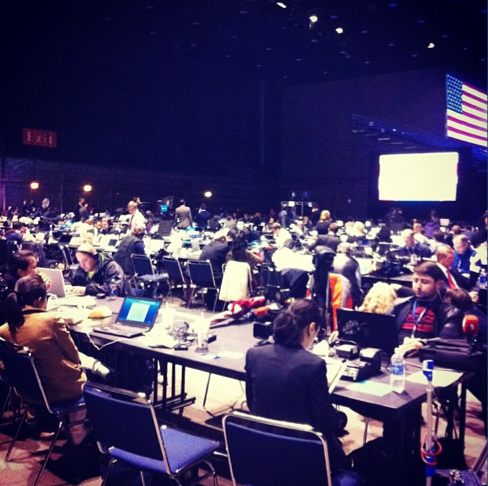 That absolutely pales to what it must have been like in that arena with the crowds and the election on the line. Unforgettable just doesn't cover it does it? All I can say is WOW. Just read your post. Awesome! Your mom and I texted back and forth for quite a while that night and I knew that you were there. Kept thinking about you two all night long. Kudos to Bryan! Oops! Forgot to say that this is Aunt Janet. Hugs!